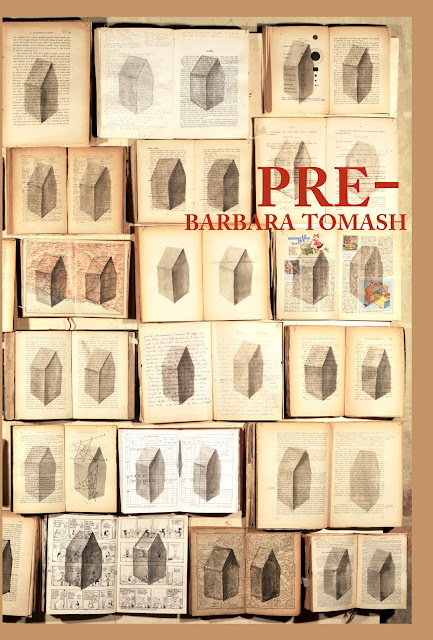 Arriving, appropriately enough, in my mailbox prior to the official release date, Berkeley, California poet Barbara Tomash’s fourth full-length poetry collection is Pre- (Black Radish Books, 2018) [see my review of her prior collection here]. As Brian Teare describes the collection on the back cover: “By ingeniously uncoupling prefixes from their stems Barbara Tomash divorces ordinary words from their workaday labor of denotation.” There is something reminiscent here of Toronto poet Dennis Lee’s Un (Anansi, 2003), a long poem composed as something that existed as prefix to the idea of the poem; in comparison, Tomash’s goals [something she wrote about recently via the ottawa poetry newsletter] are more linguistic, her short lyrics focusing on the subject at hand, as the prefixes themselves become her target as study. Set as poem-titles, she has composed sixty-five poems, each focusing on a particular prefix ranging from “per” to “pre” to “ideo” to “mis.” Tomash’s is an exploration based on dismantling, to understand each linguistic part and fragment singularly, to better comprehend how each might actually fit into any larger structure. A perfect blend of study and play, the poems of Pre- revel in the fragment, allowing each linguistic fracture to exist, singularly and solely, on its own, even while bringing the entire group of misfit toys together to form a logical, linguistic whole.